Since my Gatsby post was so successful, I thought I'd follow up with my equally controversial thoughts on Pride & Prejudice (2005). No, much more controversial. Sorry! But my overall opinion of the costuming is positive for a number of reasons. I have to start off with a disclaimer: I'm just talking about the costuming - my friend Rose wrote a very good post about issues with the writing, although I didn't entirely agree with her - and I'm not saying it's better in costuming or as a whole than the 1995 version. Frankly, the two are so far apart that I hardly see them as the same thing and don't really compare them. One is a faithful, longer form adaptation and one is a more romanticized retelling in shorter form. Though I do think it's odd that the more sexual additions with Colin Firth don't get the same treatment as some of the changes with Knightley and MacFadyen MOVING ON! The main trouble with the costuming in P&P2005 is that the designer, Jacqueline Durran, mixed the artistic and the accurate without committing enough to either aspect. In short, the more accurate costumes come off as unattractive and the more artistic costumes come off as inaccurate. It's really too bad, because the accurate costumes are decently accurate, and the artistic costumes combine modernity and history in a visually pleasing way. Overall, Durran went for a very common costuming technique: putting richer characters directly on-trend or ahead of fashion, putting less wealthy characters or characters father from urban centers in styles dating between two to ten years previous, putting poor characters in clothing sometimes twenty years old, and putting older characters in coats and gowns from their youth. This works as a visual characterization cue for even those uninterested in historical fashion to pick up on (falling under "acceptably artistic but not preferable" in my book), but is not accurate. For middle/upper-middle class provincial people, fashion moved as quickly as the mail. Though they couldn't go to Paris or to the best dressmakers and modistes in London, they could transmit style changes through letters, subscribe to magazines, or purchase clothing long-distance and have it sent to them. Those in the cities could see the changes in fashion themselves and have their new clothing made to its conventions. The working class and poor had the options of remaking their clothing, or of purchasing secondhand clothes from a few years ago. While people of the past had many fewer clothes than we do today, all classes saw remodeling and repairing as necessities, and keeping up with what appeared fashionable or normal was more in that line than in the constant consumption of new clothing, as today. But, as I said. An artistic choice, and a very common misconception. Most of the daywear for the Bennet sisters is fairly accurate to 1793-1795 (although they all lack enough petticoats for the fuller-skirted look popular in the 1790s). For example, in the opening scene Elizabeth's brown gown has long sleeves and a gathered, front-closing bodice, Jane is in an open robe and sheer kerchief, and Kitty and Lydia have colored chemise gowns with a neck ruffle. Mrs. Bennet is, vide last paragraph, more years behind her daughters in another open robe, slightly high waisted, over more solid stays. Because of the rapidity of the transition and her figure, she looks more like ten years behind, but really - she's not too far away from fashion except for her sleeve ruffles. The most important questions when interpreting film costuming are: what did the costumer intend? and did the costumes achieve that intention? Durran has said "Sometimes you want [the costumes] to stand out, but it has to be subservient to the point of the scene." Most of the costuming for P&P2005 seems intended to serve the point made in the scene - Elizabeth wears browns to show that she's practical, etc. 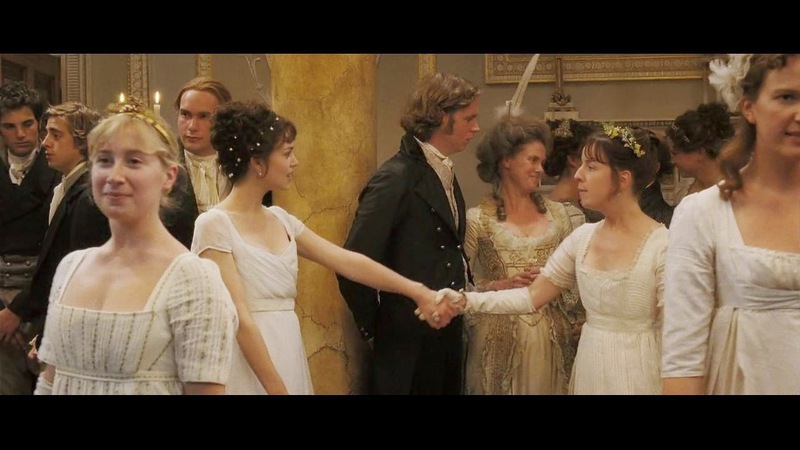 - and nowhere are the costumes more about serving the scene than at the assembly where the Bingleys and Darcy meet the rest of the town. The residents are dressed in a mixture of styles from the 1780s and 1790s, and some of them aren't bad at all. 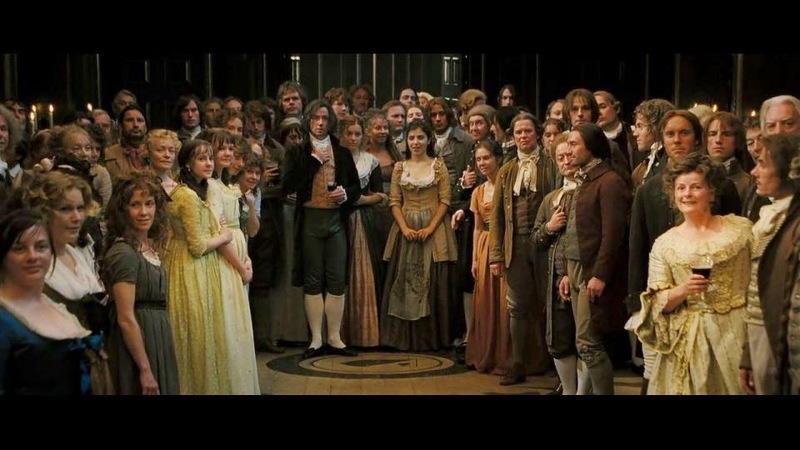 Plenty of actors have been costumed in paler or more attractive colors, but in the center, where Mr. Darcy (and the audience) is directed to look by the diagonal lines of people, is a sea of brown cloth, workaday clothing, and scraggly hair. Is this because Jacqueline Durran and Joe Wright had no idea what was appropriate for costuming? No, it's to highlight how horribly deary and shabby this place looks to the newcomers. In this shot, accuracy comes second to interpretive ability. It's been said that Miss Bingley is in her underwear, but this is not true. Her gown has distinct underbust seaming and sleeves made in two layers - she would have been recognizably wearing a gown, though it would have been incredibly daring in 1796. Even the merveilleuses wore longer sleeves (although their dresses were much more sheer, balancing it out). But that's not as important as the fact that it's clearly more fashionable and more attractive, setting her apart from the townies. In every scene involving a juxtaposition - Caroline vs. Elizabeth, everyone else vs. the Bennets vs. Elizabeth, Elizabeth vs. sisters, Jane and Elizabeth vs. Caroline - accuracy comes second to interpretation, while scenes without it (or characters who aren't being compared) tend to be more accurate. Would it have been possible for them to do this more subtly with everyone in accurate clothing? Yes, but instead of being something for the entire audience to grasp, it would be essentially an easter egg for the most dedicated, and I suspect would have still drawn criticism from people comparing the costumes to the 1810s. I've seen the dress at the Netherfield ball critiqued for being too white - because while the Regency loved the little white dress, that was not the only color worn at balls. And that's true. 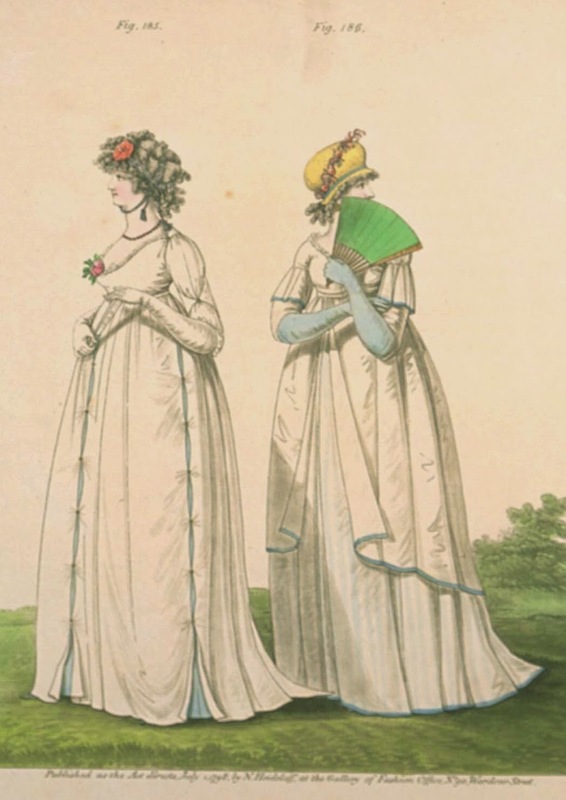 But prior to the Regency, during the 1790s, fashion plates and satires show an overwhelming amount of white gowns. It's entirely possible that all of the young ladies at a ball in the late 1790s would be dressed in white. Jane's gown overall appears the most accurate. The sleeves are a little short and puffed, more appropriate to ca. 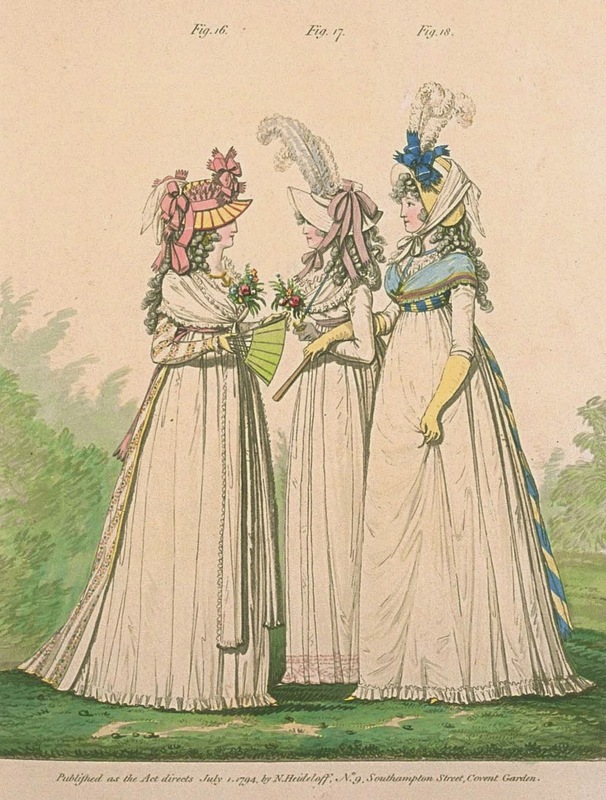 1804 or later, and they have an entirely modern keyhole in them (likely an intentional, artistic anachronism), but that is exactly the curve of the neckline depicted in very many fashion plates. The gathering in the bodice and skirt also accurately mimics the fullness in gowns at the time. Elizabeth's sleeves are much more the thing. Her crossover bodice also came into fashion at that time, appearing in day and evening dress. 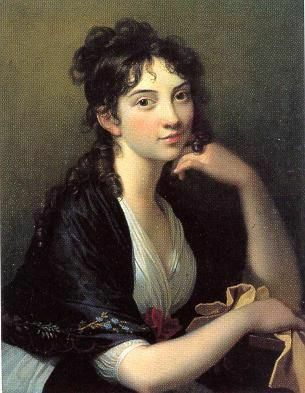 But crossovers of the 1790s usually were higher up on the chest, forming a V rather than a sweetheart neckline, and her waistline is strangely low given how fashionable her crossover is. (I suspect that Elizabeth's waistlines are all rather low due to a properly high waistline being unflattering to Knightley's figure.) Both her and Jane's hairstyles are antique-flavored modern: they would benefit from more curls hanging down, or from bandeaux wrapped around them. Charlotte Lucas's dress has a lot more ornamentation - too much, most likely to indicate her higher status. With tucks, lace insertion, and a square neckline, it looks more like an lingerie dress from the early 1910s. However, her hairstyle is excellent. 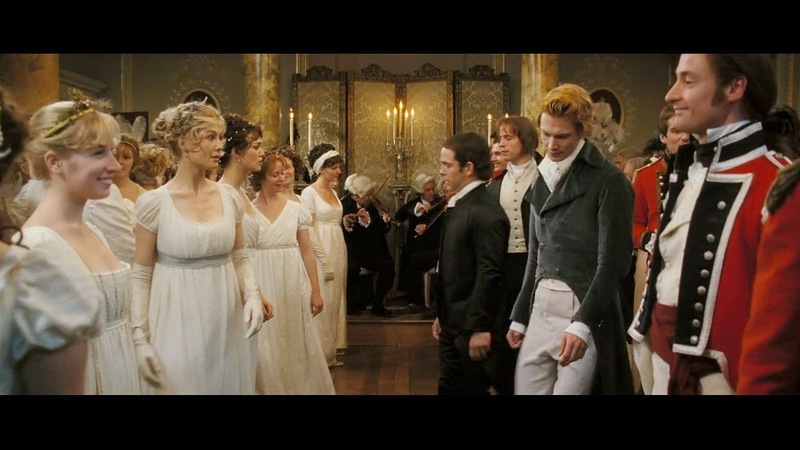 Lady Catherine is as behind fashion as Mrs. Bennet was at the assembly, for that same costuming rule of thumb. 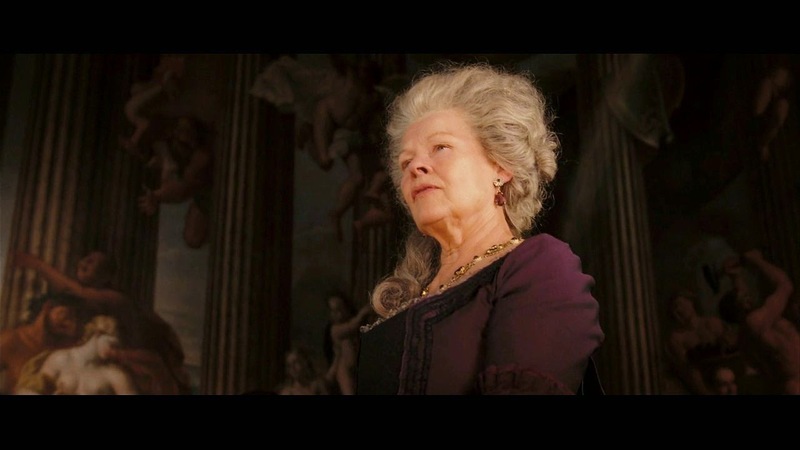 And while her sumptuous purple sacque does (artistically) make her look regal and display her conservatism - just like the Dowager Countess's extremely outdated wardrobe does on Downton Abbey - it's ridiculous from an accuracy standpoint. Women of means simply didn't cling to old styles that way. Matrons might keep wearing heavier, darker silks instead of diaphanous muslins, though many did transition, but they would not retain entire outfits. The styles of the 1790s are much different from those of 1813. In the late 1790s especially, during the transition into full-Neoclassical, they can seem odd and ugly. 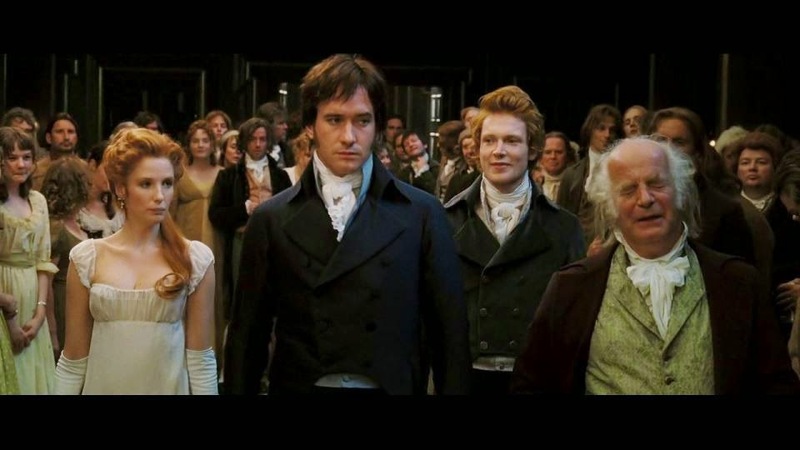 No, they're not flattering on Keira Knightley, and I've seen many criticizing her casting in P&P2005 as well as in The Duchess because of how little she resembles the fashionable figure of the day ... but is casting based on who looks best or worst in the clothing really a principle we should get behind? There's plenty to complain about when it comes to the 2005 adaptation, and you are of course free to complain about all of it and more. Did the dirt and mud come off as more realistic than previous depictions, or gratuitous? Did Mrs. Bennet seem humanized from the 1995 version, or was the humor sucked out of her? But I beg you, please at least start out your judgment of historical costuming in any movie by checking when it's set and looking at portraits and fashion plates from that time period. Not about costuming, exactly, but about your (other people) casting comment: It was extremely appropriate to cast someone who "little resembles the fashion figure of the day" to play Lizzie Bennett. Because the deal is, she's different, right? As for costuming--is it true that the lesser-endowed can't pull off an empire waist? This could save me many hours of shopping angst! Oh, definitely! Elizabeth's supposed to have a thin face, at least - no reason she shouldn't also be thin all over. I kind of think so. Imogen Poots (who played Georgiana in Death Comes to Pemberley) is a beautiful goddess but the costuming did her no favors. The high waistline only looks right with a bust. Late to the party, but feel the urge to comment. I disagree that a small-busted figure can't pull of the high Regency/Empire waistline. It all depends on the proper undergarments. And it's true that Jennifer Ehle did not very closely resemble Jane Austen's limited description of Elizabeth Bennet. Aside from her dark and sparkling eyes. I certainly can't pull off empire lines with my relatively large bust (UK32F/30FF) but that might have more to do with being short waisted anyway and having quite an hourglass figure (my waist is 12" smaller than my bust and hips). Add to that being pretty much all legs and no torso and raising the waist line just makes me look more ridiculous. I also don't look great in drop waist styles as they tend to go too far the other way. Personally I've always thought the fashions with empire waists or general looser fit (1920s included) look far better on naturally slender/ruler shaped women of any size. They don't get quite as much gaping around the waist area. But then I'm just not aesthetically drawn to these kinds of fashion, I much prefer a well defined waist. To look good in an empire waistline you've got to have a narrow upper body- shoulders, (bust isn't as important but shouldn't be too big) and the ribcage need to be narrower than the hip area. This body type (the pear shape) actually looks nice in high waisted gowns (beeing ruler slim also helps ;)) Anyone with wider shoulders (like Keira Knigthleys) or bigger bust and slim hips or hourglass figure will look not his best in this style because it doesn't enhance the slim part (waist/hip) of its wearer. I think it interesting that such a style was worn by all persons- no matter whether it flattered its wearer or not.